in a Kahoku area, which went to ruin by the China incident. The number of employees was 80,000 people at the beginning. The number of employees at the time of the end of the war was 180,000 people. 70 % of the employee's items was the people from China. South Manchuria railway incorporated company supplied capital, a man, and technology, and held the real power of Kahoku traffic. Required police powers and the right of a supervisor of a same trade kind on the enterprise were granted to this company by the Japanese government. The greatest trouble of this company was destruction of the route by an anti-Japanese group. Defense of a military was insufficient and established the police-affairs organization specially to the head office. "Rokei" of the armed police affairs which consist of much Japan and a China employee was organized. They use police powers at time of peace, and battled at the time of Communist insurgents' attack, and defended the route and the institution. Police-affairs organization leader's Japanese's large majority was the person experienced in the military man who has distinguished services in the China incident. A police-affairs employee's instruction class carried the Kahoku traffic sword. of Prague Castle in the Czech Republic. different although the tassel is the same as the for officers. It is a trademark to the position of a cherry. considered to be a Koa Issin Swords. 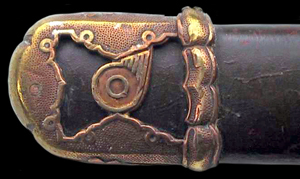 A Kahoku traffic sword is the same as that of the Mounting (Koshirae) of an army Typ 98 Guntō. 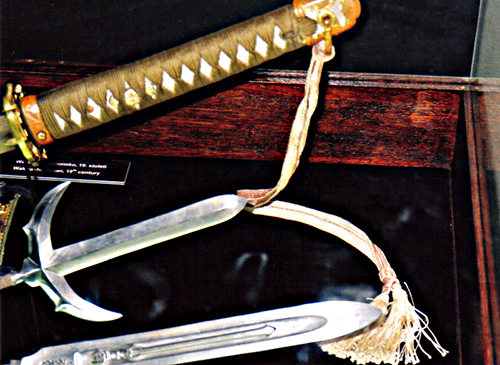 A trademark attaches a ahoku traffic sword to a Kabuto-gane and a Ishizuki. And the color of a tassel is different. 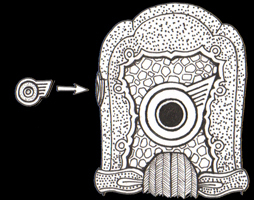 The difference from an army Guntō is these two points. This is the first time that the color of a tassel was checked this time. When a cherry tree was full bloom, Mr. Rowson visited Japan together with Mrs. Michiko in spring of 2004. I showed two persons to the Japanese Sword Museum in Yoyogi. I was impressed by understanding the essence of a Japanese Guntō well. He photoed the unusual Japanese Guntō of a tassel currently exhibited by the Prague royal palace, when he traveled Prague. Since he received restrictions in photography, he drew the details of a Kabuto-gane on the illustration, and provided for me. He is the graphic artist. He understands the heart of Japan more than a Japanese. I am happy about it above all.